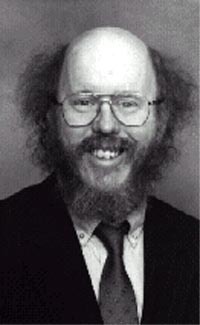 James Bovard (born 1956) is an American libertarian author and lecturer whose political commentary targets examples of waste, failures, corruption, cronyism and abuses of power in government. He is a USA Today columnist and is a frequent contributor to The Hill . He is the author of Attention Deficit Democracy and nine other books. He has written for the New York Times , Wall Street Journal , Washington Post , New Republic , Reader's Digest , The American Conservative and many other publications. His books have been translated into Spanish, Arabic, Japanese and Korean. "James Bovard serves as policy advisor to The Future of Freedom Foundation. ... He is the author of a new e-book memoir, Public Policy Hooligan. ... He was the 1995 co-recipient of the Thomas Szasz Award for Civil Liberties work, awarded by the Center for Independent Thought, and the recipient of the 1996 Freedom Fund Award from the Firearms Civil Rights Defense Fund of the National Rifle Association." "Author of the recent Terrorism and Tyranny, journalist Bovard (b. 1956) has established himself as today's most effective investigative reporter for liberty. Nobody comes up with more graphic material and serves it up so dramatically, which is why he has been denounced by many of the President's top underlings." "... for 'prolific writing about government abuses of individuals in their economic and personal lives.'" "Journalist James Bovard has written a series of remarkable political books and articles that have knocked the props out from under some of the biggest government policy frauds of our times." "Bovard has made quite a writing career out of his desire to penetrate the fog of deception that shrouds so much of what government does these days to expose the truth that the state is becoming ever stronger and the sphere of liberty is constantly shrinking." "I cannot stand to read much of a James Bovard's book at one sitting. His books enrage me too much. He catalogues horrors of interventionism. He monitors the enforcement of government regulations by real-world bureaucrats. ... His case studies are not randomly accumulated; they are carefully selected to support a moral case against government intervention into the economy. ... Occasionally, he offers an aphorism. 'Democracy is two wolves and a sheep voting on what to have for dinner.' That one is worthy of Bastiat. Bovard's books evoke moral outrage. This is why they are so important." "With the Bush team cheer-leading all the way, Israel reinvaded Lebanon in July in response to Hezbollah's seizure of two Israeli soldiers. ... Americans need to pay attention to what is happening in Lebanon because there are many politicians and political appointees in Washington who want to see U.S. troops join the fray. This would be as foolish now as it was in 1982." "But seriously, folks ... Drug warriors like to stress that anti-drug programs target the guilty and it is only an accident —and a rare one, at that— when innocent people are killed. Yet it is apparently routine policy for Peruvian jets to strafe the survivors of a shootdown." "In April 2002, the Karzai government offered farmers up to $600 an acre not to plant opium. Many of the farmers who accepted the government proposal got defrauded. Instead of cash, they were given a government voucher that was often very difficult to redeem. In other cases, farmers acceded to government demands to destroy their crops but were never paid anything, not even a voucher. Some farmers concluded that the government was even more devious than the people who previously bought their opium." "President Bush has once again decreed that his personal pen is the highest law of the land. ... His action vivifies that the rule of law now means little more than the enforcement of the secret thoughts of the commander in chief. ... The American Bar Association recently declared that Bush's signing statements are 'contrary to the rule of law and our constitutional separation of powers.'" "China did not need the U.S. government's permission to repress its own subjects. But the U.S. terrorist designation of ETIM shielded China against international criticism. Wang Yong, a specialist in international relations at Beijing University, observed, 'The U.S. action on ETIM was probably a posture in exchange for China's support on Iraq.' (China is a member of the UN Security Council and could veto a UN resolution endorsing military action against Iraq.)" "Democracy can be a good method for reaching agreement on standards of weights and measurements used in commerce, but is a poor method for dictating wages and prices. Democracy should be a system of government based on common agreement on issues that must be agreed upon, and tolerance—however grudging—on all other differences." "Government preservation police have seized control over the exteriors — and often the interiors — of hundreds of thousands of homes and businesses. ... the premier preservationist organization, has gone from seeking to educate Americans about historic treasures to clamoring for maximum restrictions on private land use across the nation. ... Taxpayers might be surprised to know that the trust — which receives $7 million a year from the federal government — has bankrolled the political opposition to property-rights initiatives." "What if being permitted to choose a master once every four years is the primary 'freedom' left? Are citizens merely choosing whose vassal they will be? Many citizens today behave like slaves who spent their time wishing for a good master, rather than scouting up information on runaway routes." "If drugs were legal, we would still see deaths from overdoses, but there would be far fewer deaths from gun battles among drug dealers, far fewer neighborhoods destroyed destroyed by drug dealers, and far fewer deaths from contaminated drugs. The question is not whether drugs are bad for the individual but whether government has a right to punish people for how they treat their own bodies." "The fact was that the United States had orchestrated an attack by South Vietnamese commandos on North Vietnamese territory before the alleged conflict began. But Johnson lied and commenced bombing, and Congress rushed to cheer him on. In Vietnam, as in Iraq, the U.S. government pushed hard to get an election to sanctify its puppet regime." "Fifty years ago, the Hungarian people bravely expelled Soviet tanks from Budapest and proclaimed their intention to create a democracy. ... Two and a half years later, it was the Hungarians who, more than any other Eastern Europeans, brought the Iron Curtain crashing down. In May 1989, Hungarian government officials cut the barbed wire on the border with Austria. ... Hungary again reminds us that we do not need to bow down to whomever manages to capture political power." "On September 13, Reagan authorized Marine commanders in Lebanon to call in air strikes and other attacks against the Muslims to help the Christian Lebanese army. ... Navy ships repeatedly bombarded the Muslims over the next few weeks. ... October 23, 1983 ... The explosion left a 30-foot-deep crater and killed 243 marines. ... Reagan quietly withdrew U.S. combat troops from Beirut in early 1984. ... Muslims also responded to U.S. troops by seizing American hostages. Reagan sent military equipment to Iran ..."
"... if congressmen truly wanted to help worthy farmers, Freedom to Farm is a miserable failure. A 1998 USDA study found that most of the benefits of the act are going to landowners – often absentee landowners – not to the people who actually sow and harvest. Landowners responded to new subsidies by raising the rent farmers paid." "The First Amendment states that 'Congress shall make no law ... abridging the freedom of speech.' The Founding Fathers could have done nothing to make it clearer that the government has no right to gag the American people. However, in recent years, the Constitution is proving little or no barrier to systematic repression. ... it is ludicrous to presume that would-be terrorists are lunk-headed enough to carry an anti-Bush sign, when carrying a pro-Bush sign provides closer access to the president. ... If Americans tolerate such official repression, then their docility will earn them whatever chains the government chooses to impose." "When Bush travels around the United States, the Secret Service visits the location ahead of time and orders local police to set up 'free speech zones' or 'protest zones' where people opposed to Bush policies (and sometimes sign-carrying supporters) are quarantined. These zones routinely succeed in keeping protesters out of presidential sight and outside the view of media covering the event." "The Farm Board was certain that a world shortage of wheat was imminent and that importing nations would soon come begging to America. Instead, Canadian and Argentinean farmers reaped windfall profits ... Its massive cache ... depressed world prices, since every grain dealer in the world knew that the United States would eventually dump its surplus on the market." "Americans seem to have forgotten why the Founding Fathers prohibited government from spying on them. ... such blind faith in government simply ignores the lessons of U.S. history. ... The purpose of the Fourth Amendment was to prevent government officials from having 'dictatorial power over the streets' and elsewhere ..."
"... an epidemiologist and an expert on the effects of sanctions, estimated in 2003 that the sanctions had resulted in infant and young-child fatalities numbering between 343,900 and 529,000. ... Sanctions wreaked havoc on the Iraqi people, in part because the Pentagon intentionally destroyed Iraq's water-treatment systems during the first U.S.-Iraq war ..."
"After human-rights advocates had harshly condemned sanctions on Iraq for almost a decade, the sanctions suddenly morphed into a causus belli. ... Progressive editor Matthew Rothschild observed that Bush and Blair 'refuse to acknowledge any responsibility for those deaths ...' In reality, the United States government perennially blocked the importation of the necessary equipment and supplies to repair the water system ..."
"The U.S. government's first experience with forcibly spreading democracy came in the wake of the Spanish-American War ... President Woodrow Wilson raised tub-thumping for democracy to new levels ... During the 1920s and 1930s, U.S. military interventions in Latin America were routinely portrayed as 'missions to establish democracy.'" "Killing in the name of democracy has a long and sordid history. ... The U.S. government is currently spending more than a billion dollars a year for democracy efforts abroad. But Thomas Carothers, the director of the Carnegie Endowment's Democracy and Rule of Law Project, warns that Bush policies are creating a 'democracy backlash' around the globe." "Big government requires big lies — and not just on wars but across the board. The more powerful government becomes, the more abuses it commits and the more lies it must tell. Interventions beget debacles that require cover-ups and denials. The more the government screws up, the more evidence the government is obliged to bury or deny." "... in late September 2006, Congress voted to effectively legalize torture and to pardon all the torturers and torture policymakers. Has the U.S. Capitol building acquired at least an odor of the Tower of London? ... the law that Congress passed will be a cornucopia of barbarity that will be likely to afflict people around the world." "The democratic-inevitability theory is also akin to the Marxist theory of the withering away of the state. Marx asserted that, after the creation of communism, the state would simply wither away, since there would be no need or incentive for people to exploit one another. Democratic inevitability implies that, once democracy is achieved, politicians will no longer seek power to violate the rights and liberties of citizens. For some unexplained reason, after democracy becomes universal, voting will turn politicians into choir boys." Discusses the consequences of establishing "parity" of agricultural prices, in the name of "fairness"
"After the enactment of the Agricultural Adjustment Act in 1933, bureaucrats used the doctrine of parity to dictate how many pounds of peanuts each farmer could sell, how many acres of tobacco he could plant, how many boxes of oranges he could ship, and where he could sell his milk. Parity provided a noble-sounding pretext ... to justify the arrest of thousands of farmers for planting or selling more of their harvest than the government permitted." "Between 1949 and 1971, however, urban renewal razed five times as many low-income housing units as it created and evicted more than one million people from their homes. In one of the first major challenges to the federal urban-renewal program, a federal district court struck down a Washington, D.C., land-seizure program in 1953 ... But in November 1954, the Supreme Court overturned the federal district court and effectively gave government officials unlimited power to confiscate and redistribute land." "The naive response to politicians triumphed in the weeks after the 9/11 attacks. By the end of September 2001, almost two-thirds of Americans said they 'trust the government in Washington to do what is right' either 'just about always' or 'most of the time.' Amazingly, the attacks even boosted Americans' confidence that government would protect them against terrorists." "President Bush is proposing to medievalize the American legal code by permitting the use of coerced confessions in judicial proceedings. ... the Bybee memo ... began by largely redefining torture out of existence. It then explained why even if someone died during torture, the torturer might not be guilty if he felt the torture was necessary to prevent some worse evil." "The 'debate' in Congress illustrated how elections are now about consecration, rather than representation. Elections have become something for rulers to shroud themselves in, rather than leashes used by the people. Politicians are obsessed with maintaining the imagined dignity of their class, not in resolving doubts about honest vote counting." "... on February 24 , Ashcroft proudly announced the most decisive attack ever on purveyors of bongs ... At a time when political leaders warned that a terrorist attack on the homeland could be imminent, more than 1,200 federal law officers were involved in Operation Pipe Dreams, ... the biggest attack on glass bowls in American history." "Presidential deceits on foreign policy have filled cemeteries across the land. ... Lying and warring appear to be two sides of the same coin. Unfortunately, many Americans continue to be gullible when presidents claim a need to commence killing foreigners. It remains to be seen whether the citizenry is corrigible on this life-and-death issue." "I started to become politically aware at a time when government lies and abuses were roiling the nation and the world. ... Roaming in the East Bloc in the mid-1980s gave me a stronger sense of the evil of tyranny. ... I occasionally tried my hand at humorous writing ... I sent a satire on the failure of the all-volunteer Congress to the New York Times." "Scott talks to Jim Bovard, author of the new book The Bush Betrayal, about the book, and about the administration." "The rising gullibility of the American people may be the most important trend in U.S. democracy. With each passing decade, with each new presidency, it takes less and less to snooker Americans. And a candidate only has to fool enough people on one day to snare power over everyone for four years." "This book does not aim to analyze all Bush policies. Instead, it examines an array of his domestic and foreign actions that vivify the damage Bush is inflicting and the danger he poses both to America and the world. Bush governs like an elective monarch, entitled to reverence and deference on all issues." The introductory paragraph uses material from the Wikipedia article "James Bovard" as of 06 Jun 2018, which is released under the Creative Commons Attribution-Share-Alike License 3.0.